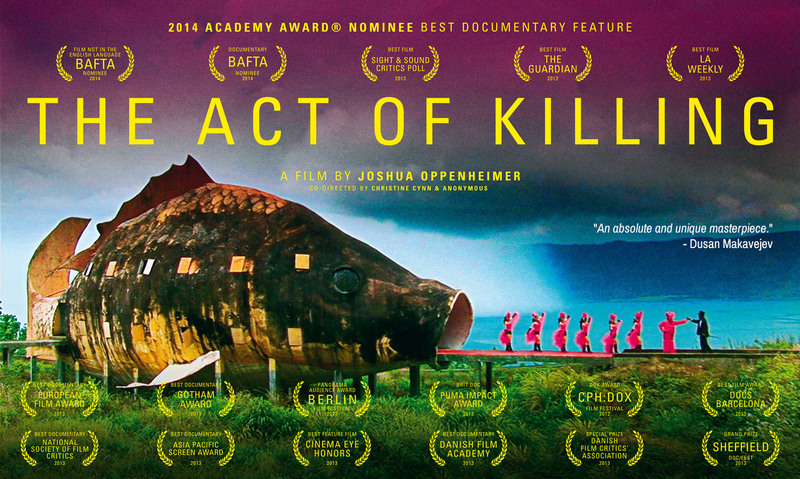 As The Look Of Silence starts it’s run at the Picture House, Friends committee member Bill Walton takes a look at Oppenheimer’s earlier companion piece The Act Of Killing. Truth can be stranger than fiction. This is my favourite film documentary of all time … but maybe it will take second place in my heart after I have seen its follow-up The Look of Silence showing daily from Friday 19th June. A military dictatorship took power in Indonesia in a coup in 1965. The new regime gave its blessing and protection to death squads who massacred over a million communists and other activists, particularly among the ethnic Chinese population. With Western assistance, the Suharto dictatorship kept its grip on power and ensured that their propaganda version of their rise to power remained largely unchallenged. What is a radical film director to do? If you are Joshua Oppenheimer you learn the local language, get to meet some of the gangsters and paramilitaries, and then let them boast about their exploits by creating their own remarkable, surreal film. And what stories they act out, what performances they give, drawing on their great love of American movies. Oppenheimer’s skill is that he plays the role of provocateur. He not only films their chosen scenes, but also their reactions to their own performances and to the acts of other perpetrators/performers. As for the gangsters, they are pleased with the result. They say it is truthful. Do they start to show remorse? That’s for you to judge. At the very least you are likely to reflect on the relationship between film and violence. Making The Act of Killing was personally dangerous for all the film makers… most of the credits at the end of the film just read ‘anonymous’. Oppenheimer himself risks assassination if he returns to Indonesia. But the story does not end there. Activists organised underground showings of the film in Indonesia, and gradually people started to challenge the regime’s ‘patriotic struggle’ version of the genocide. Human Rights organisations welcomed this evidence about the death in the killers’ own words. And The Look of Silence explores the same issues but from the point of view of the victims. Make a point of seeing The Act of Killing. You won’t forget it! Some very disturbing stuff. But also has a message underneath that makes it work most. Nice review.